Lanard Fournette, a redshirt sophomore running back at LSU, was recently arrested on underage gambling charges in Baton Rouge. The 20-year-old star running back stands accused of using a false ID to gain entrance into the L’Auberge Casino Louisiana’s gambling laws dictate that 18 is the legal age for pari-mutuel gambling (including the state Lottery and horse track betting) and 21 for all other forms. Fournette was able to successfully enter the casino under false pretenses with the casino staff not recognizing the fake ID. Adhering to state gambling laws is the only way to ensure legal gambling. Louisiana is strict in only permitting gambling in specified jurisdictions within the Bayou State—Baton Rouge being one of them. Other gambling venue alternatives include riverboats, though Fournette would have been in violation of the same law had he decided to try his luck there. There are multiple legally sanctioned offshore casinos that accept players 18 and over that would have provided a legally sanctioned alternative for Fournette. Unfortunately many adults are not aware of these types of options. While gambling laws in other states, such as Florida and California, may permit entrance into casinos for patrons at least 18 years of age, many regions, like Louisiana, set the age limit at 21. The presence of alcohol at most gambling venues is a factor in the age restriction. Fournette’s fake ID may have been enough to get him through the casino doors, but it is difficult to remain in the casino for long, especially if you need more money, with a fake. Security footage shows Fournette entering the casino, sitting at the craps table and proceeding to play for roughly 15 minutes or so. After running out of money, Fournette attempted to make a cash withdrawal from the casino. This procedure requires you to show ID, prompting Fournette to show his real ID in order to obtain cash. At this time, the casino realized their error and began questioning him. He was temporarily detained by casino security, but managed to leave before authorities arrived. Fournette admitted to the casino staff that he has used another person’s ID to gain entrance into the casino. Illegal gambling charges were later filed and he was booked into East Baton Rouge Parish Prison. His bond was set at $1,000. LSU’s football team has elected to handle the incident internally. LSU team spokesman Michael Bonnette reported that Coach Ed Oregon is aware of the situation. Attorney Brent Stockstill is representing Fournette and remains optimistic that his client will be offered a pre-trial diversion program as first-time offender. 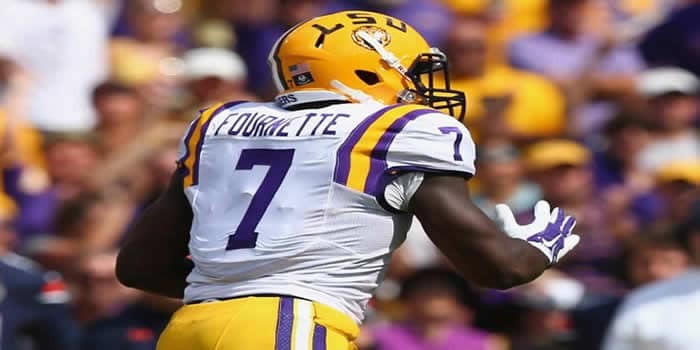 The younger brother of former LSU star and now recently drafter Leonard Fournette, Lanard is a promising talent. Lanard was redshirted as a true freshman and later played in games against Jacksonville, Missouri and Southern Miss. His full roster debut is scheduled for this upcoming season. That status could change as the season nears, but that decision is up to the coaching staff.